172 Comments This post may contain affiliate links. Chocolatey and sweet fat bombs. 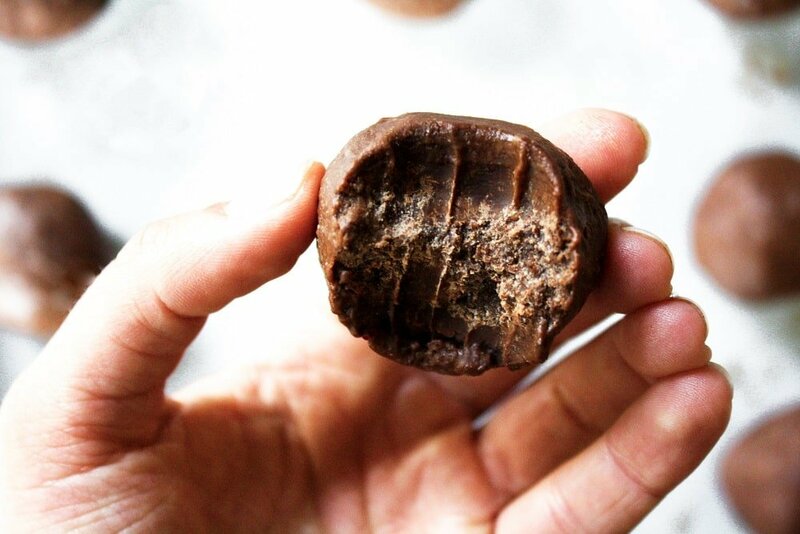 These Fudge Fat Bombs taste just like a piece of fudge, but without the refined sugar! 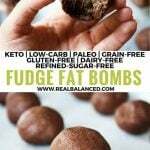 These fat bombs are simple to prepare, contain minimal carbs, and are a perfect keto-friendly and vegan-compliant option to satiate you between meals and satisfy your sweet tooth! There are few things better than biting into a piece of chocolate fudge! The one simple way to make fudge better? Make it low-carb and into keto Fudge Fat Bombs! 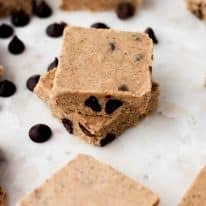 If you’ve been wondering how to make low-carb fudge or looking for low-carb fudge recipes, you’ve come to the right place! What Are Keto Fudge Fat Bombs? Fat bombs have become a staple snack in our house. We tend to eat a higher fat and lower carb diet due in part to the satiating effect of fat, but mostly due to the fact that fat just plain tastes REALLY GOOD. 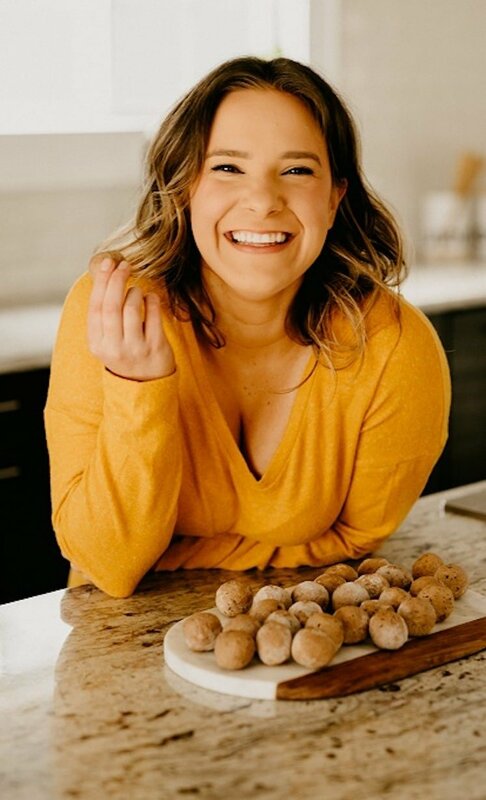 Fat bombs are high-fat bites of goodness that are perfect for your low-carb, ketogenic diet! Whether you just need a small snack to keep you satiated between meals or if you have a craving for sweets, fat bombs are going to be your new best friend! In our house, we always have these Fudge Fat Bombs on-hand because I love to enjoy one as an after-dinner treat! You can sweeten these Fudge Fat Bombs with either pure stevia or, my personal favorite, Lakanto Monk Fruit Sweetener! Stevia is a sweetener that is derived from the leaves of the plant species Stevia rebaudiana. It contains 0 calories, 0 grams of carbohydrates, and rates at a 0 on the glycemic index, making it a safe option for diabetics. NOTE: For this recipe, the stevia I used is VERY POTENT. A little bit goes a very long way. So, if you choose to use stevia but use a different brand, you will likely need to add more. 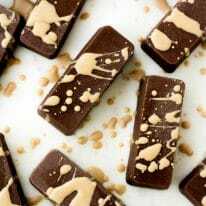 In this recipe, like in a majority of my keto dessert recipes and fat bomb recipes, I prefer to use monk fruit sweetener. Like that of stevia, monk fruit sweetener contains 0 calories, 0 grams of net carbohydrates, and rates at a 0 on the glycemic index, making it another safe option for ketogenic dieters and diabetics. I personally include Lakanto Monk Fruit Sweetener in my diet every day as I prefer its flavor and texture over stevia. I have been following a ketogenic diet for quite some time and monk fruit sweetener has allowed me to enjoy desserts, fat bombs, and baked goods while continually remaining in ketosis. If you are looking for a sweetener that tastes like sugar and is low-carb, keto, vegan, and paleo-compliant, I highly recommend trying Lakanto Monk Fruit Sweetener! You can use code “REALBALANCED” for 20% off your total order! And, if you need more keto-friendly monk fruit-sweetened desserts, check out this list of over 40 monk fruit-sweetened dessert recipes! I am also excited to share that I have partnered with Lakanto to share a Taste Test Bundle with you all! If you’ve been waiting to try monk fruit sweetener, now is the time to order! This deal includes classic monk fruit sweetener, golden monk fruit sweetener, a recipe e-Book, and Lakanto’s Taste Test Guarantee! Read more about and place your order for the Taste Test Bundle here! This recipe for easy Fudge Fat Bombs is sure to become a staple in your house! I highly suggest making them often, especially if you are someone who follows a ketogenic diet! 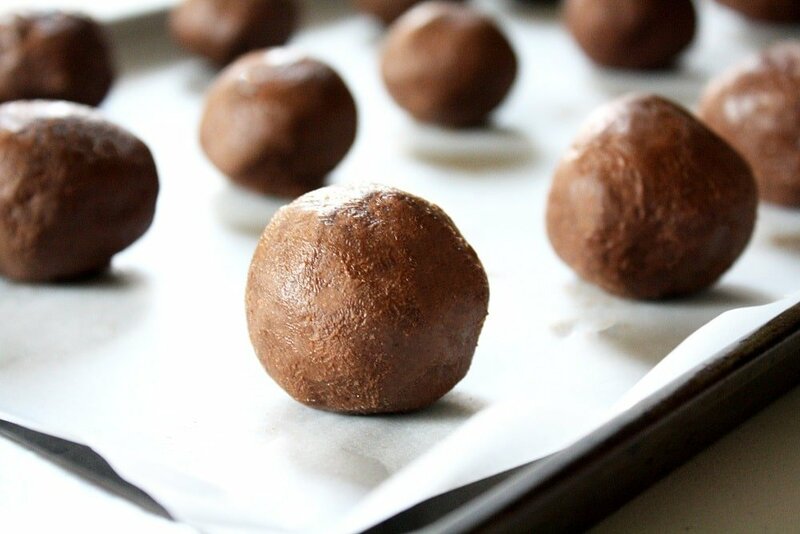 This recipe for chocolate fat bombs is also great if you follow a paleo diet or a vegan diet and are trying to reduce your carbohydrate intake! 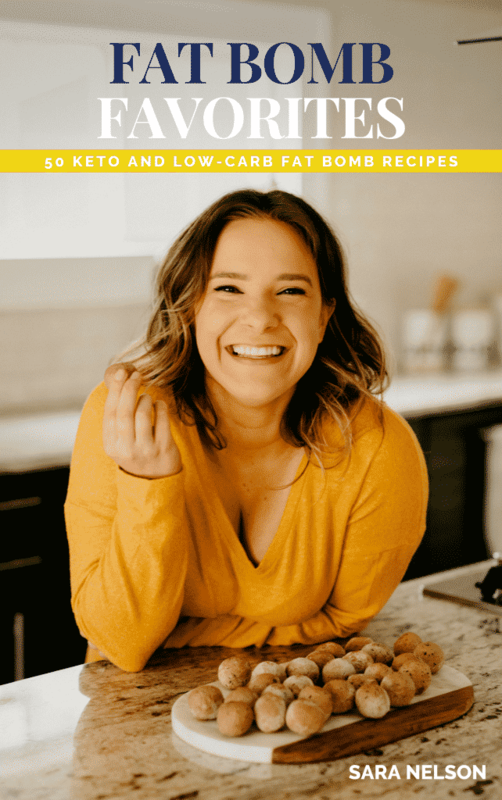 Keto and Low-Carb: One fat bomb contains only 1.4 grams net carbs per serving! Paleo: This recipe is free from grains, gluten, soy, and dairy and are therefore paleo-compliant. 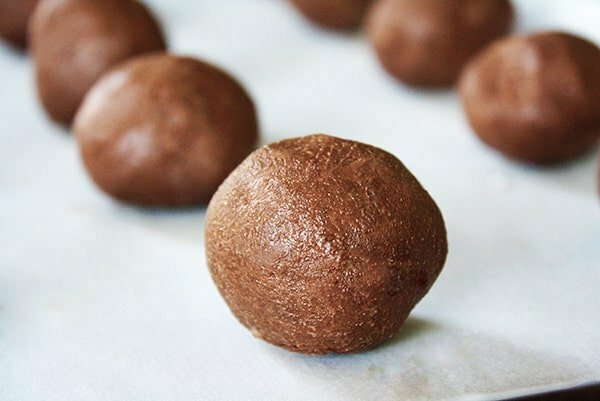 Grain-Free and Gluten-Free: Coconut flour is used in this recipe, which is both grain-free and gluten-free, making these fat bombs safe for those who are allergic or intolerant to grains and/or gluten. Dairy-Free: Coconut oil is used in this recipe in place of butter. These fat bombs are both dairy-free and lactose-free. Vegetarian and Vegan: These Fudge Fat Bombs are both vegetarian and vegan as they do not contain any animal products. 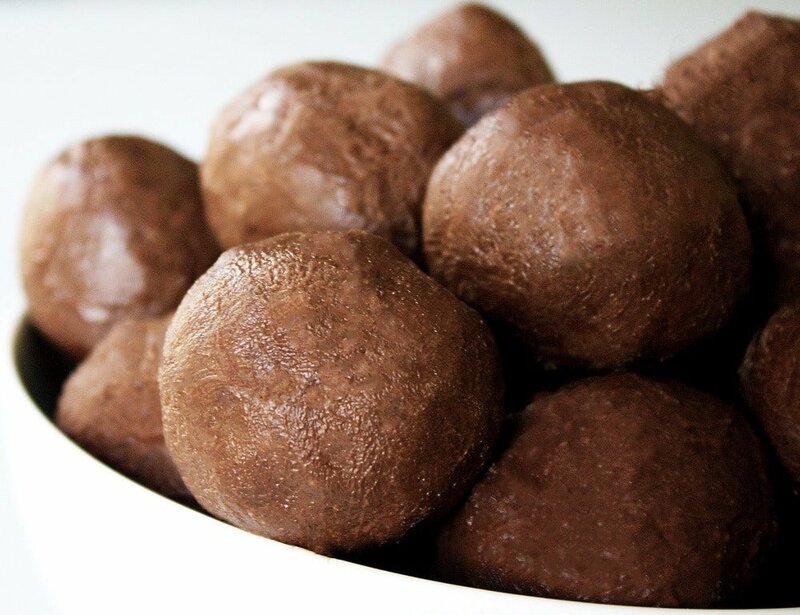 Refined-Sugar-Free: These fat bombs can be sweetened with stevia or monk fruit sweetener. One fat bomb is only 1.4 grams net carbs per serving! You can enjoy one (…or two) and remain in ketosis! These Fudge Fat Bombs are the ultimate ketogenic dessert! 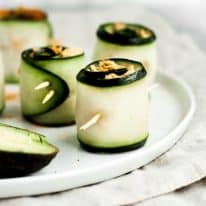 This recipe is keto, low-carb, paleo, grain-free, gluten-free, dairy-free, vegetarian, vegan, refined-sugar-free, and contains only 1.4 grams of net carbs per serving! Over medium heat in a small pot, melt and combine almond butter and coconut oil. To the same pot, add dried ingredients and stir until well-combined. Allow mixture to cool slightly and taste test to determine if additional sweetener is needed. Add more as necessary depending on your preferences. Pour mixture into bowl and transfer to freezer to solidify, approximately 60-90 minutes, depending on the temperature of your freezer OR pour into silicone mold (if you choose to use a silicone mold, skip steps #4 and #5 and just allow the fat bombs to solidify in freezer, about 2-3 hours). Once solidified, remove bowl from freezer and form into balls. Tip: regularly wash hands under cold water and wipe with dry paper towel to avoid coconut oil melting in hands. Place formed balls on a flat tray or plate and return to freezer for 15-20 minutes. Enjoy! If you use stevia and use a brand that is different than the one I have linked here, you may need to add more. The brand of stevia that I use in this recipe is VERY potent and a little bit goes a very long way! If you do use a different brand, I recommend taste testing the mixture while it is still in liquid form and adding more sweetener if necessary. Store fat bombs in airtight container in the freezer. When you want one, pop one out, allow to thaw for a few minutes, and eat up! Could you use coconut butter instead of coconut oil? I don’t think that would work here unfortunately. If you want to sub out coconut oil and you can eat dairy products, butter would likely work here! Thank you for the receipe, they taste quite good. I am confused at how you come up with the carb and fiber count though. Clicking on each of your ingredients and looking at their labels shows different numbers. Almond butter 7 carbs, 4 fiber for 2tbsp, then multiply by 8 to get to one cup is 56 carbs, 32 fiber. Cocoa powder is 3 carbs and 2 fiber for 1tbsp, then multiply by 8 to get 1/2 cup is 24 carbs, 16 fiber. Coconut flour is 8 carbs and 6 fiber for 2tbsp, then multiply by 8 for a cup, divide by 3 for 1/3cup is 21.3 carbs, 16 fiber. Coconut oil, sweetener, and salt all have 0 net carbs. Adding those numbers up we get 101.3 carbs, 65 fiber for the batch. Divide by your 30 count gives 3.38 carbs, 2.13 fiber. How are my numbers so different than your 4.5 carbs, and 2.9 fiber? Thanks. Hi, Joe! Thanks so much for your comment! Looks like the almond butter I use has had an updated nutrition label released since I published this recipe. I cross-referenced all of the other ingredients and it looks like we’re showing the same calculations now. 🙂 Thank you! No problem, thank you for the great info. By the way for those who want to go even lower carbs, the lowest nut butter (that tastes good) I can find is Georgia Grinders Pecan butter. It is not cheap but it is 4 carbs with 3 fiber, so only 1 net carb per 2 tbsp. Ooh, thanks for that recommendation! I’ve never tried their Pecan Butter! Sounds delicious!!! Joy, if you’re wondering how many fat grams in the Pecan Butter that Joe mentioned, I would check Georgia Grinders’ website! Hi there! I’ve been trying to find a sugar alternative and I’ve heard a lot about the monk fruit sweetener. Your post said it had 0 carbs but when I looked at the nutrition facts on the link you posted, it says it has 4g of carbs per teaspoon. Am I reading it wrong? I’m new to the whole Keto/low carb world so I’m trying to learn. Thanks!! Great question! When calculating net carbs, you take the carb content, subtract fiber, and subtract sugar alcohols. There are 4g of carbs per serving in Lakanto Monk Fruit Sweetener and 4g of sugar alcohol per serving (4g – 4g = 0g). It’s a 0g net carb sweetener. In keto, generally people try to stay below 20g net carbs per day. Hi, Emily! The fat bombs aren’t meant to be eaten while they are completely frozen. The purpose of freezing the mixture is to solidify them so they set. If you would prefer, you can refrigerate the mixture, but they will just take longer to harden. You can also store them in the refrigerator. I made a batch of these fagbombs last night, I like it! I couldnt believe how effective they are at knocking out hunger…I dont even want to eat lunch! I wonder if I could switch the cocoa for a protein powder, to help with protein numbers. Im going to check out a few more of these recipes, thanks! So glad you enjoyed, Tony! I bet these would work great with a chocolate protein powder. Yummy, wow really yummy. I took a short cut and used the microwave. I melted the coconut oil and almond oil in a measuring cup, mixed those then until combined then added all the other ingredients. I additionally added a teaspoon of vanilla extract and 1/2 tsp cinnamon. Seriously surprisingly really great! Thanks! I’m so glad you enjoyed, Hope! Thank you for your feedback!! So, I made these. Tried rolling but I did not like the mess it was making. Decided to heat the mixture back up and pour into ice cube trays. Worked great. Didn’t get 30….I got 25. As this was my first attempt at a fat bomb….I am pleased. My son had one and now is asking for more. He said it was a little bitter. Anything to combat that? It is sweet so that is not the issue. Maybe I should have used a little less cocoa. Hmmm. Will try again in the next few weeks. I am spent today as I made 3 different types of fat bombs today. I’m glad you enjoyed, Ronda, and thank you for the feedback! I would perhaps use a little more nut butter and a lesser amount of cocoa next time to combat the bitterness. Hope that helps! Hi, Sahara! Great question. So, stevia and monk fruit do not taste similar to me. I do like both of them, but prefer monk fruit sweetener. Lakanto brand is the best I have found on the market and is a blend of monk fruit sweetener and erythritol. I personally love the golden monk fruit sweetener from Lakanto the best! I suggest trying it; I have a feeling you’ll enjoy it! I suggest trying golden monk fruit sweetener! Tastes just like sugar without an aftertaste. Great in moulds, thank you , wish you could see and taste them! I’m so glad you enjoyed, Bettie! This recipe looked and sounded so delicious! I have no idea what I may have done wrong but I poured the liquified ingredients in silicon moles and stuck in freezer. I just tried one now and they are terrible. I have no idea what I did wrong other than maybe not enough sweetener. So disappointed with my turnout. Do you suppose I could remelt and add more sugar?? Sorry they weren’t sweet enough, Dawna! Yes, you can definitely thaw them and add more sweetener. I suggest taste testing them before solidifying and adding more sweetener based on your preferences while the mix is still liquid.